Chris Lavoie CD Volume 4: HUSKY BOY! Regular listeners to Liberal Talk Radio's The Stephanie Miller Show have been eagerly awaiting yet another follow-up CD from their favorite Miller Crew member, Husky Boy Boy Toy Chris Lavoie and his wild, wacky and crazy expressions. Chris Lavoie's Fabulous New CD, "HUSKY BOY! ", Is HERE! Click on the > and listen to a preview of The BRAND NEW Chris Lavoie CD, VOLUME 4: "HUSKY BOY!" Chris Lavoie Volume 4: "HUSKY BOY" is the long awaited follow-up to his previous Smash Hit CD's Volume 3: "HEY! HEY! HEY! "; - Volume 2: "YEA! ", and the Chart-Busting Debut CD Volume 1: "WOW!" 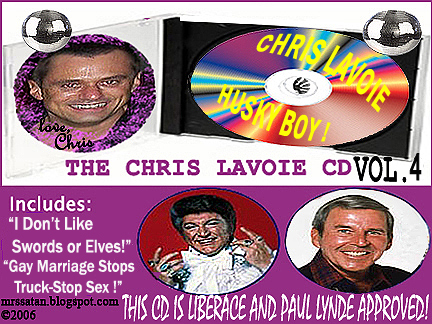 Get Husky Boy Boy Toy Chris Lavoie's CD Volume 4: "HUSKY BOY!" Today!